This field is an interesting phenomenon. Some years ago it was solid Canada thistle which we got rid of in one year by mowing. (This must have been pure luck, because we have never been able to get rid of Canada thistle anywhere else by a single mowing.) For a while thereafter the neighbor mowed this field early in the summer, but one wet year he got his tractor stuck and decided to let this field go. Several years later the parsnips starting coming in. Some years we have been able to control them by spraying with 2,4-D, but this did not seem to work this year (our timing was probably off) so we turned back to mowing. The bush hog on the back of the Kubota tractor works quite well for this sort of job, and Kathie was able to finish it in less than an hour. However, we'll probably have to mow again later to take care of any stragglers. This post is a follow-up on an earlier one this spring. Due to the late spring, flowering of our purple milkweed (Asclepias purpurascens) stands was delayed, but they are now at peak performance and easy to see in the field. Therefore, yesterday I made my yearly survey of all the stands at Pleasant Valley Conservancy. This is a great year for purple milkweeds, and with lush flowering it has been possible to find quite a few new locations. Several are what I call "spontaneous", since they are not from greenhouse transplants (although many of those are doing well also). A new spontaneous population in Unit 8 is a completely new site, quite remote from all the other sites. These new spontaneous populations have probably come from seeds that we threw out some earlier year. 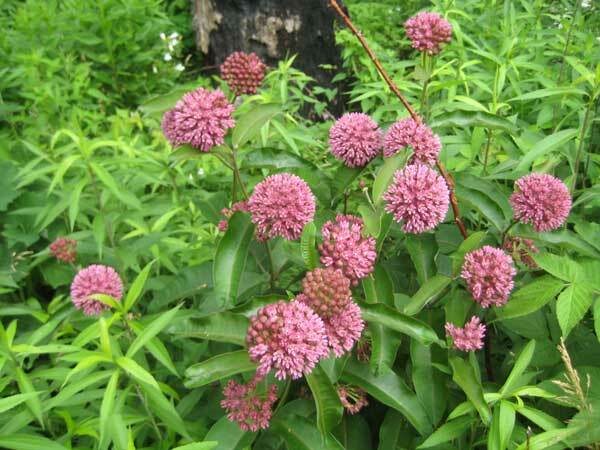 Purple milkweeds that are not flowering are extremely hard to find. If they arise from planted seed, it may take them several (or many) years to establish a root system substantial enough to support a flowering population. The photo here is from one of my spontaneous populations that first appeared in 2008 (thus, now in its 4th growing year). The photo shows only part of this outstanding population. You can also see in the background part of a large charred black oak that had died of oak wilt. This was part of a small grove of black oaks that died about the time this new population of milkweeds arose. Possibly, this milkweed patch had been struggling along in the shade of these big oaks, and the increased sunlight after they died gave the milkweeds a boost. Another interesting observation is that one of my permanently marked stands (AP-6) had plants this year for the first time since 2006. I have no idea why these plants come and go like that. Obviously, there is a perennial root system which is able to remain alive for years without sending shoots above ground. With all the great flowering umbels this year, one might expect good seed production, but this will not necessarily be the case. Last year we had over 50 great flower heads and ended up with only a single seed pod. Seed production requires successful pollination, and self pollination probably does not occur. Therefore, a lot depends upon the presence and activity of insect pollinators, mainly solitary bees. If there is a spell of rainy weather at the time when pollination is critical, we may miss it all together. 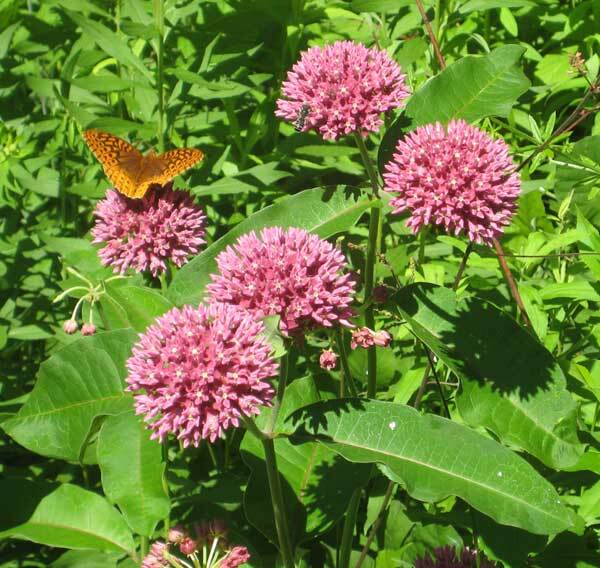 Today we enjoyed a rare treat: lots of butterflies identified by experts. 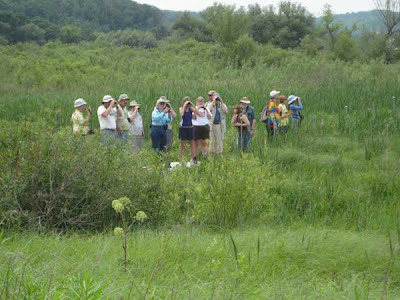 The Southern Wisconsin Butterfly Association, together with Madison Audubon Society and the Prairie Enthusiasts, toured Pleasant Valley Conservancy under leadership of butterfly photographer Ann Thering. There were 20 participants, many of whom were extremely knowledgeable. And the weather was also cooperative. The photo above shows part of the group using the boardwalk to get closer to the wetland, where, among others, there were large numbers of Baltimore Checkerspots. One of the Great Spangled Fritillarys was seen nectaring on a glade mallow flower. 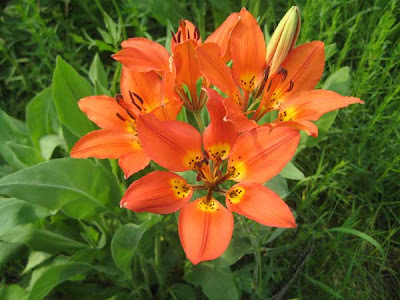 Mid June is wood lily (Lilium philadelphicum) time in southern Wisconsin, although there is always considerable uncertainty about peak flowering. The photo here is of a nice plant that Kathie was able to establish originally from seed. It took quite a few years before it first flowered, but has been displaying nice color for the past 4 or 5 years. Our favorite native site for wood lilies is Black Earth Rettenmund Prairie, and some nice specimens are already showing there. Because of the late spring, the huge display we generally have here has been delayed, but it is now coming on. Last night we ran our annual field trip to Rettenmund Prairie. There were quite a few open flowers, but even more important there are dozens (hundreds) of plants in bud. With the recent rains, these should be opening soon. Thus, any time in the next week or so should be fine for a visit to Black Earth Rettenmund Prairie. Just stay on the trail. Reed canary grass (Phalaris arundinacea) is an ecologically invasive grass that causes great problems in wetland sites. It is one of the most widely occurring weeds and is exceedingly difficult to control. It is a prolific seed producer, but also spreads greatly by rhizomatous growth. Reed canary grass is known primarily as an invader of wetlands, but at Pleasant Valley Conservancy we have found it in numerous upland sites. Surveys made at the time of flowering (when it is easiest to detect) have shown small patches of reed canary grass in most of our savannas, as well as in some of our oak woodlands. 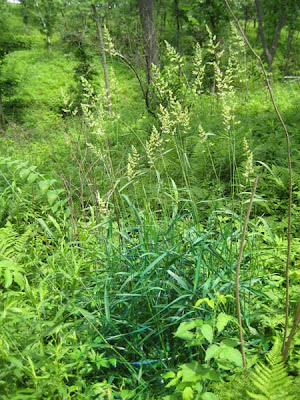 The photo to the left shows a typical small reed canary grass patch. The inflorescence can generally be seen at some distance. These upland patches are generally small, usually just a few leafy tillers and some flower stalks. Once seen, the worker bushwacks through the undergrowth to the site and sprays all the leaves in the patch. Generally a single spraying is enough to eradicate these upland patches (not true for the large clones generally found in wetlands). A survey made this year in early June found over 100 small patches of reed canary grass in upland sites at Pleasant Valley Conservancy! All of these patches have been treated. 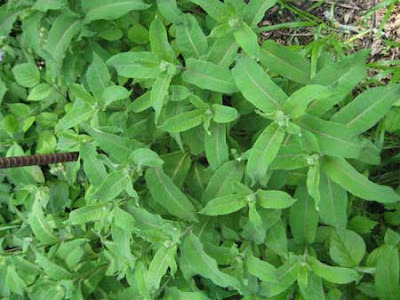 There are several grass-specific herbicides available for this work, including sethoxydim and clethodim. These agents are cyclohexanediones which act by inhibiting lipid biosynthesis in grasses. They have no effect on broad-leaved plants. 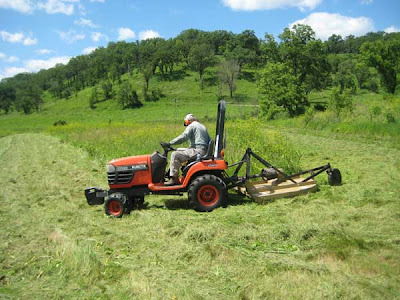 Details on the use of these grass-specific herbicides for reed canary grass and other undesirable grasses can be found in a concise paper published by Craig Annen in Plants out of Place, the newsletter of the Invasive Plants Association of Wisconsin. Spderwort (Tradescantia ohiensis) is one of the prairie/savanna species that seems to do well in a wide variety of habitats. One of my favorite spiderwort habitats is the rocky ballast of the Wisconsin & Southern Railroad, which follows U.S. Route 14 all the way from Middleton to Mazomanie (and beyond). It seems strange to see a beautifully flowering plant rising out of bare dry pebbles. We had scattered patches of spiderwort along the steep bank of Pleasant Valley Road even before we started restoration, but by throwing seeds around we have managed to greatly increase the amount of this species. When the seeds are ready to collect (around 4th of July) we simply pull them from the stems and throw them uphill and to both sides. After a few years, we have managed to have spiderwort along the whole Pleasant Valley Road bank. Spiderwort is found in a wide variety of habitats in Wisconsin, although it seems be absent in the far north of the state. Photographing this species is a little tricky. Although the color of the flowers is an intense blue or purple, it's really hard to catch the color, especially with a digital camera. I was surprised when I looked in my viewfinder to see almost white flowers, even though with the naked eye they were blue. This is a species whose photos really benefit from the ministrations of a Photoshop-like program. The seeds of spiderwort are held within a pulpy matrix, making them really difficult to dry properly. They dry best under forced warm dry air, but take almost a week for complete curing. 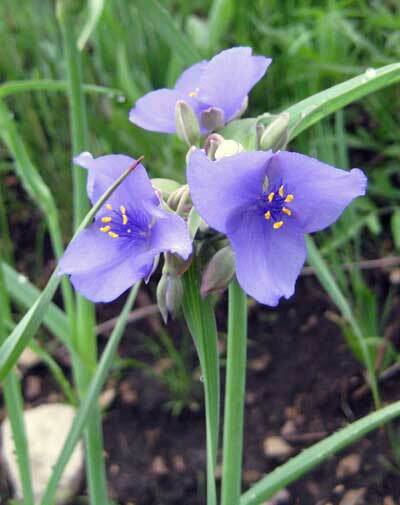 Spiderwort is a nice species to plant, as it is showy, establishes well, but never becomes invasive. We have it growing well in all of our planted prairies as well as the savannas. One of our best native populations developed in Unit 18 after we cleared it of black walnut. The first year after the walnuts were gone a large population of spiderwort appeared, and has continued ever since. 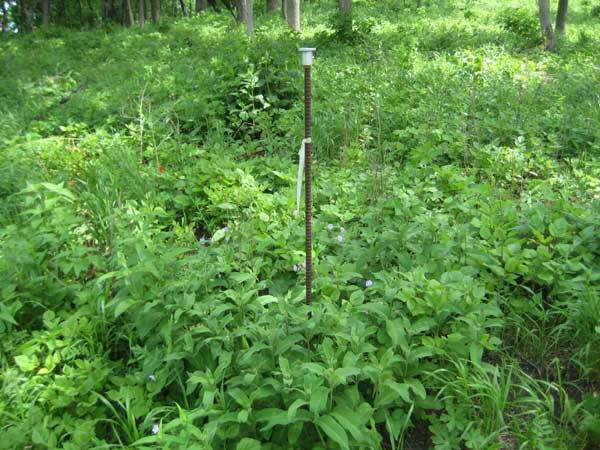 A check of the literature showed that spiderwort is resistant to juglone, the allelopathic chemical produced by black walnut. In fact, most of the monocots are resistant to juglone. Another characteristic of spiderwort is its tendency to close its flowers as soon as the sun is shining. Thus, the best time to see and photograph this species is on a cloudy day, especially after a good rainfall. The purple milkweed (Asclepias purpurascens), an endangered species in Wisconsin, does well in the savannas at Pleasant Valley Conservancy. It is one of our "signature" species. I have been following native populations since 1999. Each new population has been given a permanent marker, and is then followed in subsequent years. In addition, Kathie and I have been raising plants from seed and transplanting them into likely locations. Some of these transplants now are also permanently marked. At present there are 27 known populations at PVC, 16 of which were spontaneous and the rest from transplants. I published a paper on the purple milkweed work in the September 2009 issue of Ecological Restoration, and a PDF can be found on the PVC web site. This is the time of year when purple milkweeds are first making an appearance. Although not flowering yet, most of my permanent stands are tall enough to find, and are generally in flower bud. Yesterday I surveyed all my marked populations. Of the 27 populations, all except 7 had stems. It isn't uncommon for a population to skip a year (absent, and then returns the following year), and in two cases I have had a population thrive for a few years and then permanently disappear. Also, some years a stand has lots more shoots than other years. This year, one of my spontaneous populations (photo above) has 47 stems, all with flower buds, whereas the most it ever had before was 9. The photo to the left shows how dense this stand is. If all these stems flower, this should be a specatacular sight! It's not clear why purple milkweed is so uncommon, since it is quite easy to raise from seed (see my paper). The most likely conclusion from my work is that pollination is quite variable. Despite having dozens of flowering umbels, seed set is often quite uncommon. Last year, for instance, only a "single" seed pod was formed from the large number of possible flowering stems.